Sometimes I am too tolerant and generally that is true with whitefly infestations. Perhaps that is because I have not had a serious outbreak or a great deal of resulting damage. So live and let live unless an edible crop is involved. The worst that happens is on houseplants where these sap feeding insects can breed continuously through the year. As a gift to the windowsill they leave a sticky secretion on leaves which drops from the plant. Only in the greenhouse have the white-winged adults taken to flight from tomato plants when disturbed. Adults and the scale like nymphs have secretions that can make plants sticky and prone to sooty mould. Brassicas, particularly my broccoli are prone to large collections of aphids and or white fly that make the crop unappetising. Who wants to eat bugs unless they are on a bush tucker trail. If picking and squishing is not enough control I remove affected leaves or use soapy water as a spray. Avoid getting Trialeurodes vaporariorum whitefly from newly acquired plants. Treatment and cures include the use of sticky traps, a parasitic wasp called Encarsia formosa a tiny, parasitic wasp that preys on the greenhouse whitefly. Some strains have become resistant to controls but a insecticidal soap may be an efficient control.Failing that try a systemic insecticide such as Provado ultimate bug killer. 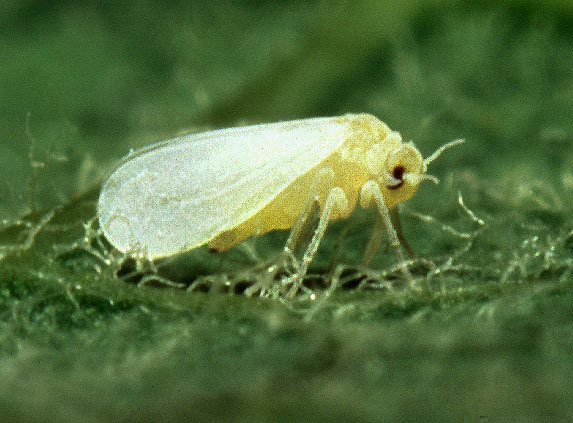 ‘Due to the whitefly feeding, plants can quickly become extremely weak and may be unable to carry out photosynthesis. Leaves will wilt, turn pale or yellow, and growth will be stunted. Gardener! gardener! there is a white fly in my soup – well button up!